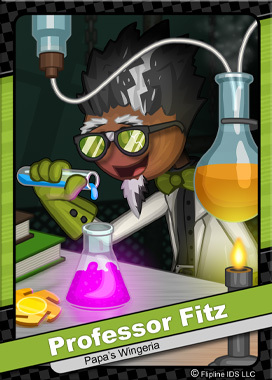 Professor Fitz is an eccentric scientist who runs Gigaloaf Labs. Within the walls of his laboratory, Fitz carries on a wide variety of research and development ranging from exotic food additives to mechanical contraptions. Fitz earned his first doctorate at the prestigious Truffleton University where he now gives highly enthusiastic lectures. Lately, Fitz has been studying the strange properties of warp coins.